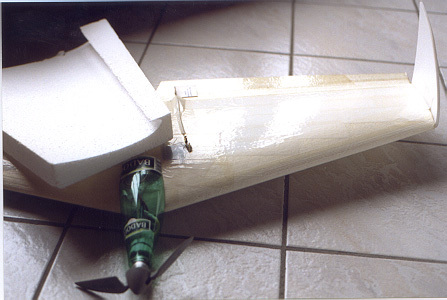 I will not describe you here the principle of cutting polystyrene wings cores using a hot wire... All that is already on the Web and in particular on the excellent site devoted to hand launched gliders (formula F3K) that I advise you to visit. By the way, small easy way for pretty good gauges : use Formica (plating material for cheap furniture...). It cuts out very well and one obtains a perfect completion after sandpapering. The wire slips idealy on it and you'll get dreaming cores! The first string is used to hang the arc, by its tensioner, at the ceiling. The arc should not be vertical (contrary to the diagram...) but it must rest on the gauges, with, approximately, a 20° angle to the vertical. The arc should not be too light; it is the weight which makes him follow the gauges. A wooden arc is fine. Fix, by a simple node, a good length of string directly on the wire, on both sides of the gauges; then make circulate the string of left around the first pulley (vertical axis), around the second (vertical axis) and finally around the third (horizontal axis), downwards. The right-hand side string, passes only on the third pulley. To be precise, it is tangenting the throat of the second pulley. 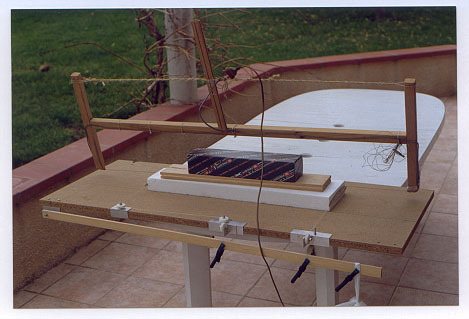 Without connecting the feeding, put the cutting wire in contact with the polystyrene bread on leading edge, tighten wire, tie two wire together and fix the weight. Under your wondered eyes everything is done alone! Schematic diagram of the multipurpose machine! The wood rule is screwed on the section of the cutting table. It can thus rock until touching the ground by an end. Let us take for example the cutting of a left wing. 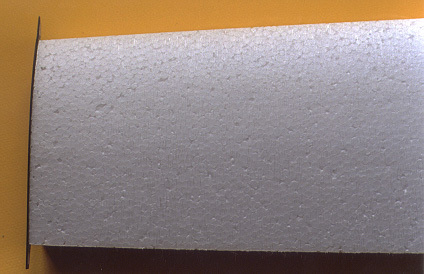 The root side of the foam bread must be put in the alignment of the right-hand side pulley. The left pulley must be put to be in the alignment of the gauge of tip of wing. The strings are attached on the rule, respecting strictly the distances to the articulation... Not to be bored, simplest is to grip them using a spring clip for example. When the cords ratio is to big (e.g: delta wings ...) it is usefull to use a "fixed point" method. You need only one gauge, the root side one. You fix the cuuting wire at one end living a rotation liberty degree. 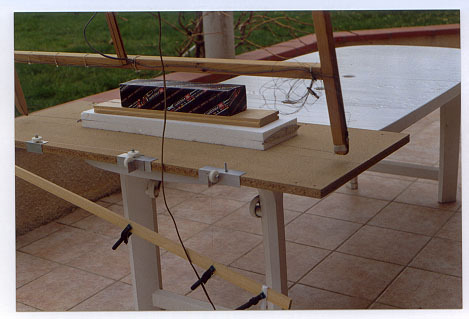 As an articulation,small aluminium sheet twisted at 90°, drilled with a small hole (a little bit larger than the wire diameter).the wire goes trough the hole, it can thus move and turn without difficulty. 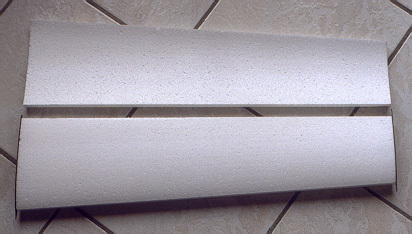 the horizontal part of the aluminium sheet is fixed on th cutting board with a clamp. One may adjust the high by twisting the aluminium. To cut the wing core, simply follow the gauge, and you will get marvellous foamies !